The BBC is giving its daily Wimbledon highlights programme a revamp this year, with the broadcaster promising more coverage of the annual event than ever before. BBC Two's Today at Wimbledon is replaced by Wimbledon 2Day, presented by Clare Balding in front of a live studio audience. The one-hour programme brings a guide to the day’s play every night with special guests providing insight and analysis on all the major talking points. 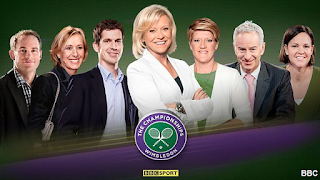 Wimbledon 2Day will be broadcast at 8:30pm on most nights, although schedules are subject to change. Sue Barker stays in charge of the live coverage, totaling 153 hours across BBC One and BBC Two, plus 15 televised courts available online, via mobile services, on tablets or via connected TV platforms via Red Button+ and the BBC Sport App. For non-connected TV viewers, the regular BBC Red Button service will offer additional coverage of the event. Full details of the scope of this year's BBC Red Button service on digital TV is to be confirmed. BBC Sport’s dedicated Wimbledon live coverage page, available at bbc.co.uk/sport will offer a wide selection of live video streams, radio, rolling highlights, text commentary and live votes. Fans will be encouraged to join in the conversation via social media with all the best comments and opinions alongside insight from BBC Sport's expert reporters and pundits. New for 2015, former US Open champion and three-time Wimbledon finalist Andy Roddick joins the BBC team, working across television and Radio 5 live with seven-time Grand Slam champion Justine Henin joining Roddick on radio duties.